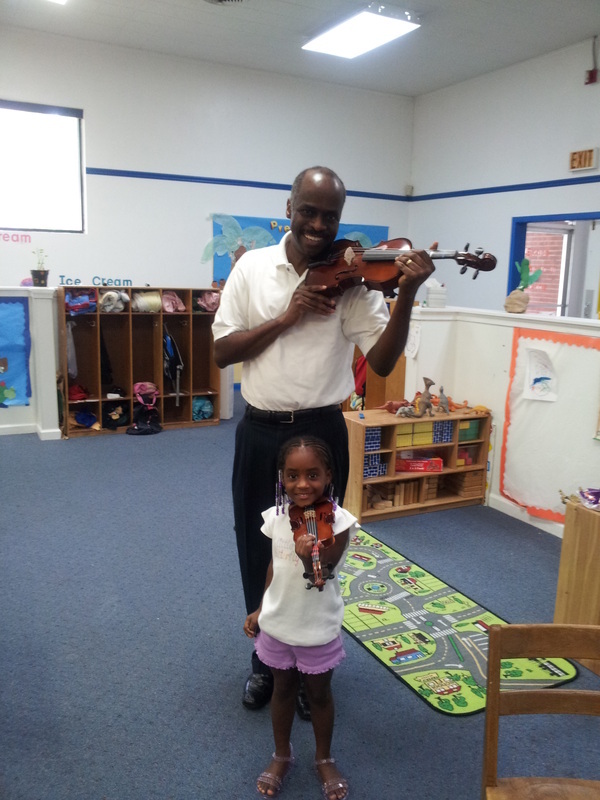 Richard Cuff with Ashlyn after she was fitted for her violin. Image used with permission of Richard Cuff. Guiding Success is a kindergarten to college pathway initiative, and The J.H. 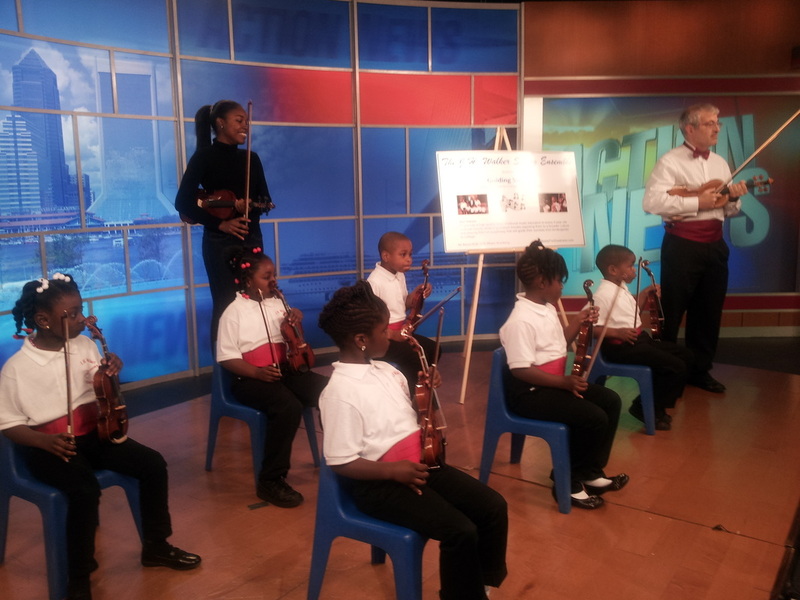 Walker String Ensemble is the only voluntary pre-kindergarten (VPK) orchestra program in the State of Florida. I spoke with Richard Cuff, who started these programs, about his work using music to unlock the potential of pre-kindergarten students that will allow them to have success through college and beyond. What inspired the creation of Guiding Success? Guiding Success unfolded over a number of years as a result of several failed attempts to find the perfect cultural fit. The program was originally called No Strings Attached and the inspiration for this program initially came from my daughter, Korah. Now a sixteen-year old, soon-to-be-junior at Douglas Anderson School of the Arts, Korah began reading on her own at eighteen months old. By the time she was two years old she would walk around the house pretending to play the violin. She initially started studying violin at four years old. As a gift for her fifth birthday we gave her a violin as we threw her a surprise birthday party at the home of her violin teacher. This was her first private lesson. On the way home from her first lesson she was very excited and she asked if I would buy a violin for all of her friends in her kindergarten class as she called out each of their names. At first I said to her that there was no way that I would do that; but even while one side of brain was saying no, the other side of my brain was calculating the cost and mapping out the structure of the program. By the time my daughter was ten years old our program had begun to take shape and was first featured in this news clip. Four years later I was hired to serve as consultant to the Jacksonville Symphony Association and take on the role as manager of the Jacksonville Symphony Youth Orchestra (JSYO). As orchestra manager, having the opportunity to see for myself from the inside out, I understood why there was very little minority participation in the JSYO. I eventually designed, developed and launched two programs to increase minority participation in the JSYO. The first program, Jump Start Strings is still being managed by the Jacksonville Symphony in six different elementary schools and the second program, Guiding Success, I continued to work on after my contract ended with the symphony ended. In 2011 we partnered with All About Kids, Inc. to create the All About Kids VPK Music Academy. That summer we began with four students and today we have 35 students in the program with the expectation to increase that number to 74 by the end of this summer. Ivan shows his form during a class on proper bowing technique. Image used with permission of Richard Cuff. This is the only Voluntary Pre-Kindergarten (VPK) orchestra program in the state. Why is it so important to get these children involved at the pre-school level? Most professionals agree that the best time to get a child involved in music education is around five years old. Very few professionals start earlier than that because of the challenges that come with a young child’s behavior. This poses a special challenge for minority children because by the time they are exposed to music at a later age in public school (if at all) they have also been exposed to the surrounding culture of rap and R&B that often makes listening to classical music unappealing. However, by beginning as early as three-years old we are able to capture the child’s mind while it is still shaping the child’s likes and dislike. Another major benefit is that at this young age the children do not become easily bored with repetition; in fact, they enjoy going over the same songs and basic lessons again and again. 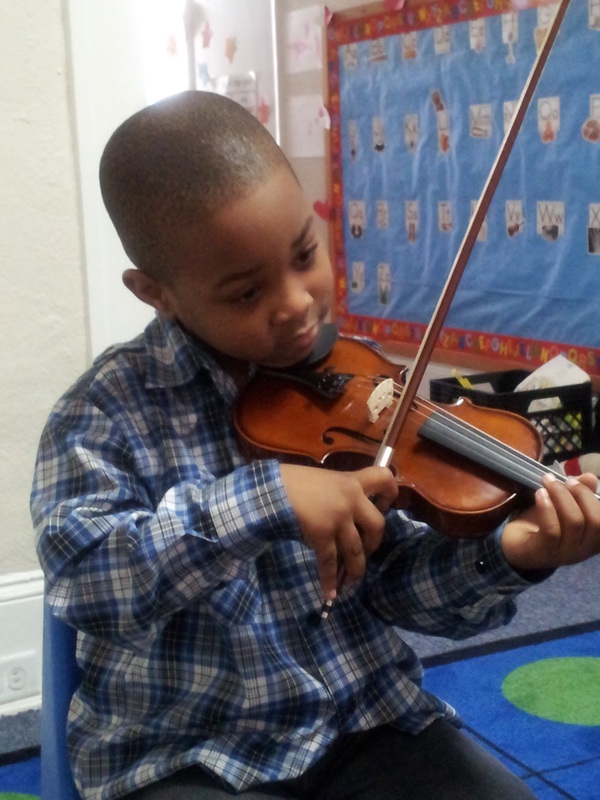 By the time they are four years old these children have habitually developed the discipline to begin learning the techniques that will help them master the skills to play the violin at a third grade level even before they are out of the K-5 kindergarten level. How will that help guide them to success through college? Initially it takes the parents and music mentors to remind them of the importance of the rules and the pledge, but eventually they become ingrained into the child’s mind and become the foundational tracks onto which everything else is built. This is certainly not a solo act and it’s not every day that you see a program like this. Who are some of your partners and key people on your team? What is your secret for success? If there is a secret for success it would be that we began in the early learning environment by partnering with All About Kids Preschool owned by Joann Walker, a retired Duval County Public School teacher. She has been providing quality childcare for twenty five years and was will to underwrite the cost of the program in the first two years. Ms. Walker already had a great relationship with the Department of Children and Families, the Duval County Early Learning Coalition, and the United Way’s Success By Six program. This created the perfect environment in which we could build our program. The next step was to get the buy-in of the parents and get them to understand that our program would treat the parent as the child’s first teacher and greatest mentor, holding them accountable for the child’s success. Within the first few months we began to see evidence that the program was destined for success. What method are you using to help the children learn so quickly; are you using any special type of music curriculum? The moment Ms. Walker and I agreed to start this program I called on my good friend Andy Bruck, a violinist with the Jacksonville Symphony. Andy started playing violin as a child for over 45 years ago and fully understood the challenges we faced. He was also instrumental in helping me to launch the Jump Start Strings Program. He researched best practices, incorporated proven techniques, and even develop a special music notation system that helped accelerate the rate at which the children could learn to read music. We have a proven method that works and we now call it The Bruck Early Learning Music Method. Guiding Success is now a couple of years old. Can you speak to some of the successes or impact the program has already had? The program is impacting the children in several ways. You only need to sit through one group practice session to know that the confidence level of the children is off the charts. They have also developed a love for learning and sharing what they have learned with each other. One of our greatest success stories is Cedric Livingston (we call him Ceddy Bear). When he came into the program, because of being in an unstable protected custody environment, he was a shy introvert and would not talk much nor participate in class activities. After about three weeks I noticed he was beginning to clap his hands ever so slightly. Today Cedric is one of our best students. His out-going personality and brilliant smile would not give you a clue that this talkative, fun-loving, six-year old was once a shy three-year old introvert. All of our students are excelling in class as kindergarteners; our two oldest students (2nd grader and sixth-grader) are excelling as well. After only four months in our program, then 5th grader Sarah auditioned on violin for Lavilla School of the Arts and was accepted, and this year, 2nd grader Daija will be auditioning for the Jacksonville Symphony Youth Orchestra. There are now 35 students (a few of them adults) that are taking either daily or weekly music lessons. In the summer of 2011 we started with four students. In addition to musical training, the program also provides other useful resources to the students and their families. How is something like a college savings account reinforced by the musical aspect of the program? We teach our students and their parents that practice does not make perfect because, “You were perfect when you walked in the door.” Practice makes improvement. It is improvement in every area of life for which we strive. Our mission is to encourage literacy through entrepreneurship and the arts. This literacy component includes financial literacy as well as literacy for health and wellness. A college savings saving account allows us the help the parent and the child develop the habit of saving while at the same time developing the mindset to incorporate other wealth-building principles including investing and home ownership. On the set at Fox 30 Action News during the morning show. This was the first public television performance for the students. Photo used by permission of Richard Cuff. How do you see Guiding Success moving forward in the future? I see Guiding Success becoming a statewide initiative and a national model. The program will become voucher-based and serve as wraparound funding to supplement VPK dollars on the State level and Head Start dollars on the Federal level. Each of our centers will feed into local public and private K-5 programs. Ultimately, I see Guiding Success being responsible for the State of Florida truly being known as a State of the Arts. The Division of Cultural Affairs truly believes that “Culture Builds Florida.” How will this program benefit Florida economically and otherwise as you work on expanding it to be statewide? This program will benefit Florida economically because as more people are encouraged to invest private dollars into early childhood education initiatives more of our young people will choose to stay in school rather than drop out, blighted buildings will be turned into rehearsal halls, parental involvement will become the norm rather than the exception and recidivism will become a thing of the past as the path to prison is circumvented by giving our children a clear path to college. It is well-known that for every dollar invested in early childhood education the state will see a return of $7 dollars. But that ROI is not only a monetary return it is also a return in social capital. Through Guiding Success we are building better citizens and equipping future leaders who now have a gift that can never be taken away and can only flourish in this positive environment. To learn more about Guiding Success and the J.H. Walker String Ensemble or to contact Richard about bringing this program to your community, visit guidingsuccess.org.